The legendary DJ John Peel will always be remembered, and loved, for giving thousands of acts a play on his radio shows that no one else would touch. His young ears kept him popular with music lovers across five decades, but many won’t know that in 1969 he launched his own Dandelion record label with the idea of getting music and bands he liked signed and thus a chance to be played on mainstream radio. 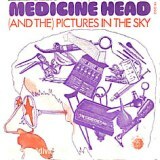 The only UK hit on his label was Medicine Head’s first hit (And The) Pictures in the Sky which reached number 22 in July 1971. At this point they didn’t have a name, so suggestions of The Mission and Dr. Feelgood & the Blue Telephone were made but they settled for Medicine Head because, literally, the melancholic ballads coupled with stompers were good medicine for the head. The tape they gave Peel was the original demo of (And The) Pictures in the Sky which was recorded in Fiddler’s kitchen and featured The Yardbirds’ Keith Relf on guitar. The finished item didn’t feature Relf, but he did produce the track. Fiddler recalled how the song came about, “I wrote Pictures in the Sky in the dressing room just before going on stage at another Midlands gig. I just started playing it that night, Peter joined in on Jaw’s Harp, and that was it, the crowd literally went wild for that song, and just wanted to hear it over and over.” The parent album was called New Bottles Old Medicine and the more recently issued CD version contains that original demo as a bonus track. With the success of the singles One And One Is One, Rising Sun and Slip And Slide, led to them headlining at the Royal Albert Hall supported by Tony Joe White. Their homemade brew driven by thumping bass-drum /hi-hat with rhythm/lead guitar has since been dubbed by historians as ‘proto-punk’ like the Pink Fairies and Stack Waddy. It’s ironical that when punk did arrive the band splintered rather than being killed by it at a time when their songs had become heavier live. One reviewer saw the microcosm of Medicine Head as the history of rock ‘n’ roll in a particular English style. The band finally split in 1977 and Fiddler became a member of British Lions and later Box of Frogs as well as occasionally reviving the Medicine Head name. As for Hope-Evans he has continued recording most in collaboration with Pete Townshend.